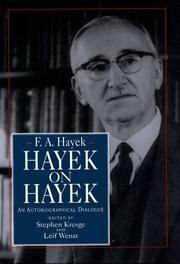  An ``autobiographical dialogue,'' derived partly from a fragment of autobiography left by Nobel Prize-winning economist Hayek and partly from interviews given by him. Hayek, born in Vienna in 1899, has been called ``arguably the most influential economist of this century.'' His work fell into disfavor in the 1940s and '50s, as his criticism of socialism and collectivism came into conflict with the spirit of the times. Since the award of the Nobel Prize in 1974, the failure of some Keynesian prescriptions (he was both a collaborator with and a rival of Keynes), and the fall of the Soviet Union, his work has attracted renewed interest. The autobiography and interviews convey the flavor of the man--modest, calm, steeped in the history of economic thought, sometimes tart in his observations. There is a charm, too, in the insight it affords into those who were part of the economic debate of the 20th century: of Keynes, whose breadth of knowledge and flexibility of mind Hayek admires while noting that Keynes was repelled by, and knew almost nothing of, the economics writers of the 19th century; of Joseph Schumpeter, whom Hayek considered a greater thinker, but one deeply pessimistic about the capacity of rational argument to persuade people; and of Milton Friedman, famous for his monetary theories, of whom he writes, ``Milton and I agree on almost everything but monetary policies.'' But Hayek's great contribution was his realization that the complexity of human affairs and responses doomed what he called ``the fatal conceit of socialism--the attempt to design and control the destiny of societies,'' for as Hayek showed in his influential book The Road to Serfdom, the failure of the design in countries like the Soviet Union led to greater and more dictatorial efforts to exercise that control. A brief but absorbing and unique insight into the great economic debates of the 20th century and those who shaped them.